Over the last year, we spent a lot of time discussing how to commemorate The FADER's tenth anniversary. We had recently combed the archives for FADER 50, so we wanted to make this issue a statement not about where we had been but where we are going. Then we realized that that is what we do with every issue, so, after much debate, we decided to focus on those people who have continually served as content providers for the pages of the magazine and website: the curators, selectors, DJs, gallerists, party throwers and artists who always give us something to write about. 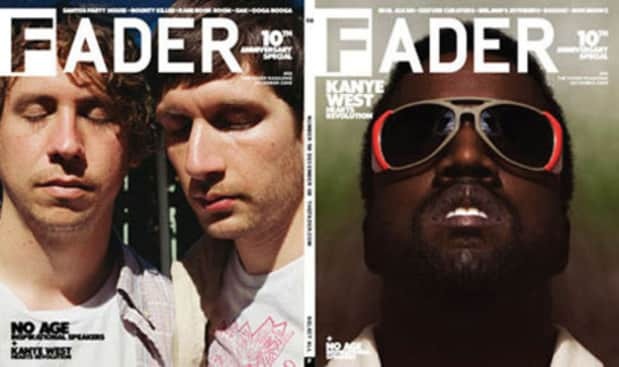 For the last few years, no two artists have given us more to ponder than Kanye West and No Age, so why not put them both on the covers? In between, we've got stories and interviews with the Santos Party House crew, Wendy Yao of Ooga Booga, Oak's gentlemen, dancehall godfather Bounty Killer, Cipha Sounds, the minds behind Partizan and The Directors Bureau, a peek into Rare Book Room studios, and a feature on DJ/producer/label head/etc Erol Alkan. Of course, we fill the rest of the pages with more of our regular coverage of future greatness, as well. As FADER boss Julianne Shepherd wrote in her editor's letter in the issue, "We believe that no culture should be separate, that everyone should have access, that we all should be together. So let’s celebrate." Do just that by downloading FADER Number 58, our Tenth Anniversary Special, for free below, and check back this week and beyond as we put up stories from the magazine and online exclusives only on TheFADER.com.